When I taught myself how to cross stitch a few years ago, I was looking for a hobby that would not only be relaxing, but would also result in handmade gifts for family and friends. My first few projects were mostly stitched baby names, with cutesy animals in pastel colors. 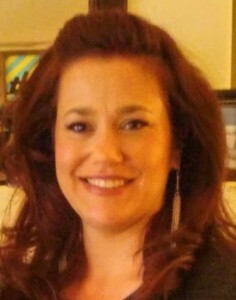 Once I felt ready to branch out a little, I searched for projects online and in stores that required more discipline. However, I was noticing a pattern: most cross stitch projects were all the same. Cute animals, serene landscapes and flowers with scrollwork…you get the idea. Then I came across something new and exciting. 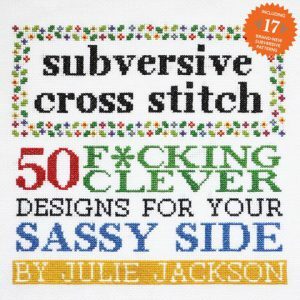 Subversive Cross Stitch, by Julie Jackson. 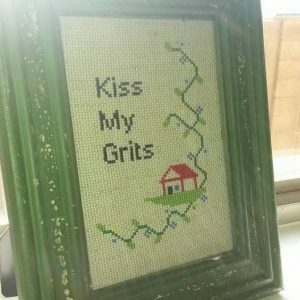 This is not your grandma’s cross stitch. It’s rude, offensive, and downright funny. Hanging any of these finished products in your home will be sure to incite conversation. I was eager to get started, and relished in the humorous gifts about to be bestowed upon family and friends. What’s great about this book is that all finished products fit into a 3×5 inch frame. The patterns are easy to follow, and you can personalize them by changing colors, or adding different borders. I have completed three patterns so far, and all the recipients have been very happy with their stitched gifts. If you are feeling crafty, check out this book or hundreds of others available at your Yavapai College Library.